This is my #1 favorite dinner! The flavors are outstanding. Not only do you have a homemade pasta sauce that is to-die-for but there are creamy layers of bechamel sauce and plenty of mozzeralla and parmesan cheese.Our last day in the hospital after Asher was born, my sweet friend and neighbor Megan called up my husband and asked if we had dinner planned that night. We did not and so she offered to bring us dinner. We thought that was so nice of her! And it was such a blessing because when we got home that night we were super hungry. When she came over she not only brought us this amazing pasta but diapers too. What a great friend! Look at those beautiful layers of pasta, homemade pasta sauce, bechamel sauce, and mozzarella cheese. Pure pasta bliss! This is the best pasta I have EVER HAD! And one of my favorite things I’ve ever made/eaten! She learned the recipe from her husband who spent two years in Italy on an LDS mission. Derek also served a mission in Italy and said that this pasta tasted most like what he had in Italy. 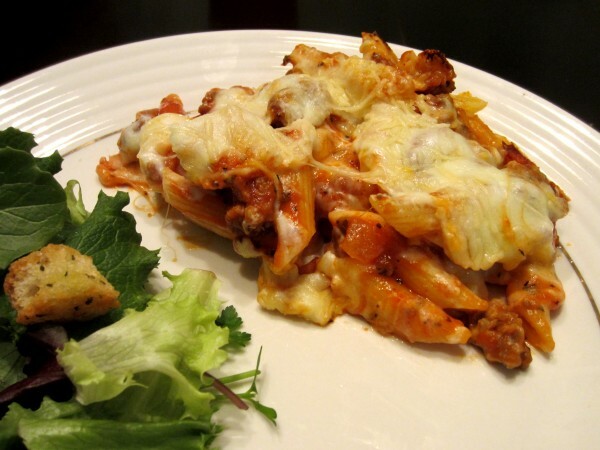 Every aspect of this Penne Al Forno is amazing. 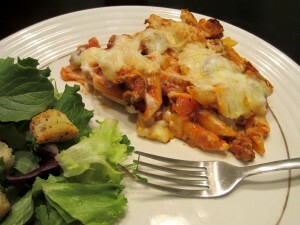 It has a homemade sausage ragu sauce which is quite simple and so tasty. My favorite thing was the creamy bechamel sauce which is layered throughout the pasta. I also loved the mozzarella and parmesan cheese on top. This is the ultimate comfort food for the pasta lover. I hope you try it! I promise you will fall in love! Using a large skillet, turn heat to medium and add the olive oil. Chop the onion and mince the garlic. When the olive oil is hot, add the onion and stir occasionally, after a few minutes add the garlic. Stir occasionally until the onion is transparent, soft and starting to color. Add the sausage to the pan. Break up the meat as you cook into small pieces. Brown well. When meat is cooked, add the tomato sauce and spices. Turn the heat down and let it simmer. Fill a large pot with water and turn heat to high. Once water is boiling add salt and the pasta. Cook until al dente. Do not overcook! It will continue to cook in the oven. To make the bechamel sauce, melt the butter in a medium saucepan over medium-low heat. When it’s melted, add in the flour and stir until smooth. Over medium heat, whisk continuously until the mixture turns a light, golden sandy color, about 5 to 6 minutes. Add the milk a little at a time while stirring constantly. This will take some time to thicken up but just keep stirring until it thickens. Add a pinch of salt. 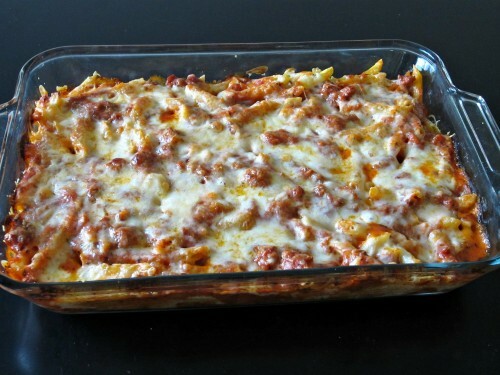 Using a 9 x 13 or 11 x 15 casserole pan put some red sauce or olive oil on the bottom of the pan. Put 2 spoonfuls of bechamel in the red sauce and mix. 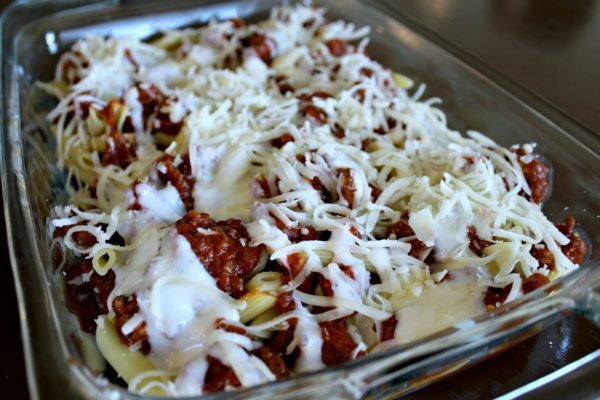 Make layers in the pan in this order: pasta, red sauce, bechamel and mozzarella. Sprinkle mozzarella cheese and parmesan cheese on the top. Bake until bubbly and cheese is golden brown about 20-30 minutes. Remove from oven, let cool slightly and serve!